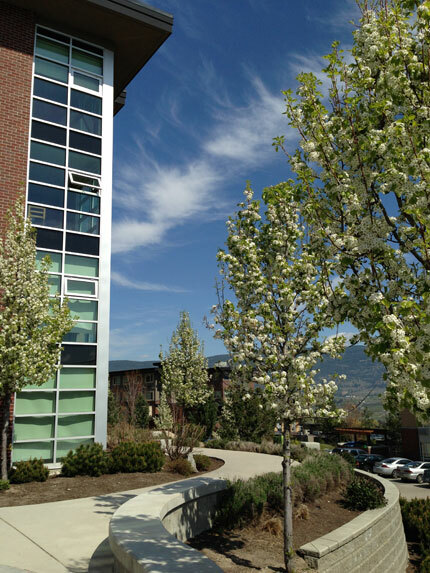 The UBC Okanagan Campus is located within the City of Kelowna. As a result, development within the campus is subject to the City’s bylaws, permits, and approval processes. In June 2008, while the 2009 update of UBC Okanagan Master Plan was being prepared, the City of Kelowna adopted the current site-specific zoning for the UBC Okanagan Campus to facilitate the campus’s anticipated growth. This zoning is consistent with the City of Kelowna’s Official Community Plan (OCP), which designates the UBC Okanagan Campus for Educational/Major Institutional (EDINST) land use. The current CD20 – Comprehensive University Development zoning for the Main Campus allows a full range of academic, research and supporting land uses essential to a university. In addition to acceptable uses, the zoning also regulates density, site coverage and building heights, among other aspects. The West Campus lands are presently zoned A1 – Agriculture 1 and are not included in the CD20 zone area. A1 – Agriculture 1 permits primarily only agricultural uses. The West Campus lands are located within the Agricultural Land Reserve (ALR) and subject to the ALR’s requirements and processes. The UBC Okanagan Campus Plan process involved a review of City of Kelowna plans and policies, as well as discussions with senior departmental staff, to place anticipated campus development into the context of its surroundings, plan for future use and development, and acknowledge the important and reciprocal roles of the campus and adjacent development in providing community benefit. Development permit approval from the City is required for any proposed alteration of land or proposed development within the defined Natural Environment and Hazardous Condition Development Permit Areas identified in the City’s OCP. This process is taken to ensure the protection of environmentally sensitive areas and groundwater resources, and to ensure safety. The City also requires a Farm Protection development permit approval for certain uses and activities on agricultural lands, and for any development proposed adjacent to agricultural lands. Transport Canada has an approvals role for buildings near airports, which affects building heights on the Okanagan Campus. The UBC Okanagan Campus Plan has maintained building heights within the limits currently understood to be acceptable to Transport Canada, and consistent with the City’s zoning for the campus.